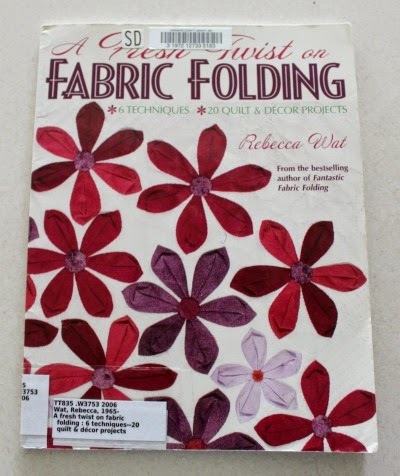 In A Fresh Twist on Fabric Folding, author Rebecca Wat takes the traditional art of origami (paper folding) and applies it to fabric to produce some interesting 3-D looks on quilts and a few other home décor items. 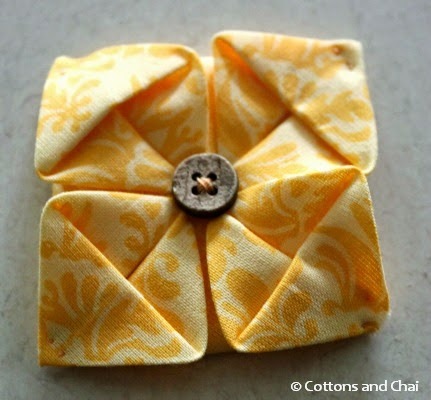 The book describes six different folding techniques that result in inside-out flowers, pinwheels, bow-ties, 3-D petals, pleated leaves/ butterflies and square flowers. The folding instructions and quite clear and a few also come with variations to give different looks. The resultant 3-D forms are certainly eye-catching and simple to make. However, the application of the techniques in the book are mostly limited to quilts. If you're into making large quilts, Wat has provided detailed instructions from fabric yardage to assembly. Personally, after having tried a few of these folding methods out, it's exciting for me to think up new and interesting ways to use my bouquet of flowers and swarm of butterflies! 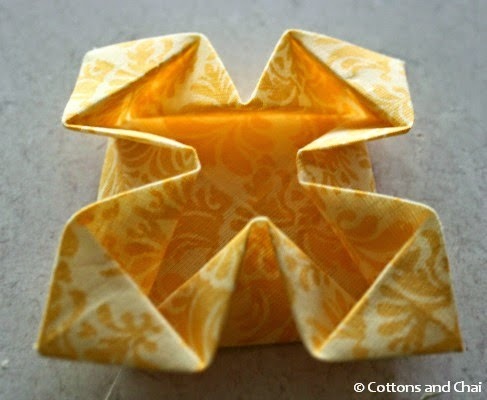 Wat does not just use origami, but also sewing - both by hand and machine to really bring out interesting forms. As a crafter who's also always looking for ways to mix and match different media/ techniques, I find this very inspiring. Creating 3-D forms is one thing, but Wat also shows how to piece them in a block to get that unusual texture on your quilt top. The Butterfly Dress - made by pleating squares of fabric and then piecing them together is the cutest project in the book, methinks! Well, the fun Indian festival of Raksha Bandhan is just around the corner. 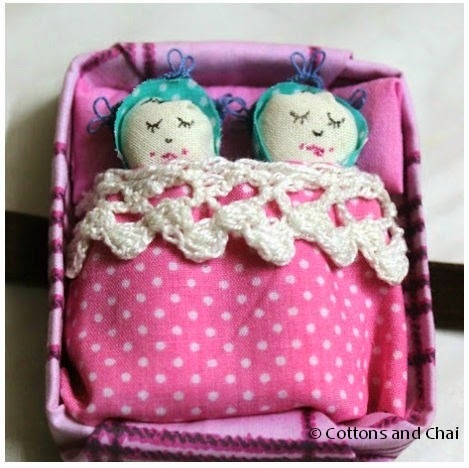 In our household, stuff like greeting cards and rakhis were and are never store-bought, always hand-made. 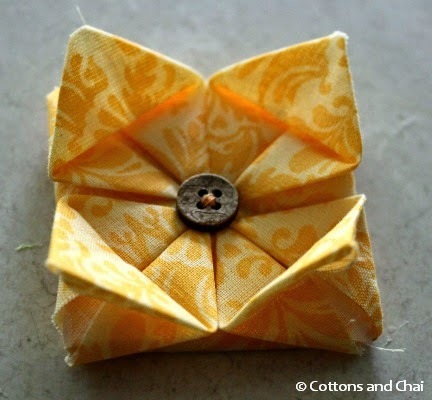 So while thinking of how to use a little fabric origami flower, I immediately thought of a rakhi! I chose a nice yellow fabric that evokes the auspicious color of turmeric. This is how it looked after folding. I then tacked down the inner petal edges by adding a button which also doubled up as the flower center. Next I tacked down the outer edges of the petals by making a couple of tiny stitches in each corner like so. Oh did I mention that I usually made 'topical' rakhis for my cousin? Like the year (almost a decade ago) when he passed his final year dental college exams, I made him one that was the shape of lips, with comical buck teeth peeking out. I must say that drew quite a (toothy) laugh! Over the years it became our thing, where my cousin looked forward to the occasion-inspired rakhi instead of a very traditional (dare I say, boring) one. I guess the most memorable one for me was the rakhi I made him a couple of years ago when he became the proud father of two adorable little twin girls! Hello! Well thanks for stopping by. Hope you enjoy all the other projects as well!